This Leeds lady won no less than seven World Championship gold medals for cycling. 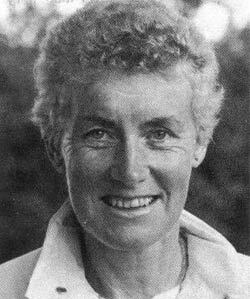 Beryl Burton also beat the Men’s record for 12 hour time trialing covering 277 miles at an average speed in excess of 23 mph. If she were still alive she wouldn’t need to be appealing to be in the team for the Rio 2016 Olympics unlike Varnish, King, Cummings and co, she would be a cycling shoe-in. In 1972 Beryl competed with her daughter Denise when they were both selected for the British team in the World Championships. In 1976 Denise beat her mum into second place in the British Cycling Road Race Championships. As the Daily Peleton puts it ‘DETERMINED in her aims, but modest in her claims of success…’ which sums up the qualities of Yorkshire folk. The 2008, British Cycling Road Race championships were held in Duncombe Park North Yorkshire. Nicole Cooke won her ninth consecutive National Women’s Road title in North Yorkshire but she needs many more wins to catch up with Beryl Burton. Rob Hayles won the Men’s race. Indeed few men cyclists could beat her 12 hour record, even today with all the latest aerodynamic improvements. A great athlete – shame not as many Olympic events for women in those days.